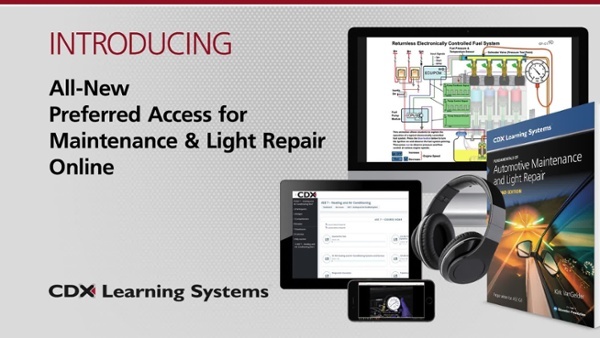 MLR Online is a complete curriculum solution for teaching entry-level automotive technology. Updated to reflect the latest ASE Education Foundation (NATEF) standards, this all new course has been built to address every style of learning. MLR Online is rich with engaging close-captioned videos, animations, and study tools along with built in text-to-speech, downloadable audiobook. Instructors have the ability to track students' progress and students have the ability to learn inside or outside the classroom. Ask your rep for a demo using the form on the right and watch a brief video tour. Your CDX Account Manager will be happy to work with you on choose the CDX package based on class enrollment. We’ll be hosting webinars this spring. Reserve your trial access here and we will let you know your demo will be available. We'll also be at a number of conferences this spring and summer. You can also email support@cdxlearning.com to schedule a one-on-one webinar training. New courses will be ready Spring 2019. Our goal is to have your new site up and running before summer break to give enough time to get familiar with the new platform.